Four decades since the passing of Spain's democratic Constitution, the "regime of '78" is sharply criticized by the Left and the Catalan independence movements. Yet former prime minister Felipe González still defends it. Spanish democracy is entering middle age. After General Francisco Franco died on November 20, 1975, King Juan Carlos was sworn in as head of state, as the dictator had planned. The royally appointed prime minister, Adolfo Suárez of the center-right Union of the Democratic Center (UCD), won the first elections in June 1977, which were swiftly followed by the Moncloa Pacts. In this agreement, the major political players agreed to prioritize reform over rupture via a series of emergency measures designed to address Spain’s structural deficits. At a time of economic recession in which democracy was repeatedly held to ransom both by regime nostalgists and the Basque separatist group ETA, this spirit of consensus and moderation formed the basis of an expedient democratic constitution, ratified by referendum on December 6, 1978. Given these beleaguered origins, the document has proven surprisingly resilient. This is no mean feat in a country lacking a strong tradition of stable parliamentary democracy, with Spaniards prone to become jaded. The future appeared particularly rocky at the start of 1981. Escalating violence and tensions forced the resignation of Suárez, who no longer enjoyed the king’s personal and political support. On February 23, the investiture of his successor Leopoldo Calvo Sotelo was interrupted by Lieutenant Coronel Tejero entering parliament to hold the elected MPs hostage and demand the formation of a provisional government under military rule. Unaware that a TV camera was still rolling, Suárez — the closest Spain has ever had to a John F. Kennedy-style president — had a better sense of theater facing the barrel of a gun than his assailant, who was quickly exposed as an anachronistic clown. The UCD was itself in free fall, and televised footage of Tejero and his stooges did more to discredit the Right than any left-wing party had ever achieved. That a coup attempt had taken place under a centrist party’s watch seemingly made the electorate less reticent about giving the Left a chance. In 1982, armed with the campaign slogan “For change,” Felipe González’s Spanish Socialist Workers Party (PSOE) rode into government with an absolute majority. The average age of the new ministers was around forty. González remained prime minister for the next fourteen years. The PSOE was eventually ousted in the 1996 general elections amid corruption scandals and revelations about government-funded anti-terrorist hit squads. By that time, former tax inspector José María Aznar had succeeded in modernizing the Spanish right and overcoming his own lack of charisma to transform the People’s Party (PP) into a credible electoral prospect. Televised debates between Aznar and González from the 1990s suggested personal as well as political animosity. Their relationship had seemingly been transformed beyond recognition when, on September 20, 2018, they shared a stage in the first major event to commemorate the upcoming fortieth anniversary of the Constitution. Having ruled Spain between them for twenty-two of the last forty years, the two emeritus presidents joked and sought to vindicate their legacies in relation to a democratic stability they claim to once again be under threat. González and Aznar share a visceral animosity towards Podemos — the anti-austerity political start-up that most effectively transformed the energy of the 15-M protest movement into electoral currency — and Catalan nationalists, both of whom have questioned whether the so-called “regime of ‘78” is fit for purpose. For better or worse, left-wing politics and democracy in Spain have been decisively shaped by González’s concept of socialism and the values enshrined in the Constitution. Ten days before his public debate with Aznar, I met with González in his central Madrid office for a frank and occasionally tense discussion about the Transition and its legacy. At the age of seventy-six, Spain’s most internationally renowned politician of recent decades has doubtless lost some of his charisma and rhetorical panache. González nevertheless remains a seductive interlocutor and privileged observer of domestic and foreign affairs, notwithstanding his semi-compulsive name-checking. During our meeting, he needed little prompting to tell me that he had responded to George H. W. Bush’s question about when he planned to write his memoirs by saying he would rather look to the future than rummage in the archives. The Spaniard has nevertheless followed in the footsteps of politicians such as Ronald Reagan and Margaret Thatcher by placing his correspondence from his humble beginnings in Seville to his time as president in the public domain. The Spanish Communist Party had constituted the most systematic opposition to the dictatorship, but was less adept at adopting to new democratic realities than the mercurial PSOE. Already by the time Franco died in 1975, a panoply of outlawed parties dotted the political landscape. Often forced into exile, a dissident political diaspora remained enmeshed in the politics of the Civil War, slow to recognize the extent to which consumer society and the arrival of mass tourism had transformed their homeland. In a context where citizens no longer believe themselves to be living in a country in perpetually forward motion, Spanish democracy finds itself at a crossroads, torn between nostalgia for a time when anything and everything seemed possible, and genuine anger against the unrealized potential of a calcified Transition. Alongside intimate personal friend and key political ally, Alfonso Guerra, a thirty-two-year-old González had wrestled control of the historic PSOE from a veteran old guard living abroad. Against a socio-political context in which age was often as divisive as political persuasion, backing from the Socialist International and the German Social Democrats alongside youth support allowed the PSOE increasingly to monopolize the progressive vote in the early years of the Transition. Often eulogized as Madrid’s greatest ever mayor, the affectionately nicknamed “old professor” remained in post until his death in 1986. Under his watch, the Francoist city par excellence reinvented itself as a vibrant urban space, in which the drug-fueled youthful creativity of the Movida placed filmmaker Pedro Almodóvar and his adopted home on the international cultural map. Success in municipal politics allowed the Spanish left the opportunity to prove they could rule without the country descending into chaos. Suárez came close to losing the 1979 general elections. That he did not has been attributed to the incumbent premier shamelessly exploiting voters’ fears by playing up the PSOE’s Marxist credentials in a television debate with González. King Juan Carlos had previously sought financial backing from the Saudi royal family and the Iranian Shah to support the UCD by exaggerating the PSOE’s revolutionary tendencies. I’ve had many conversations about Juan Carlos with Arab monarchs and it is difficult to make them understand that, in Spain, he renounced his powers. He last exercised the powers he inherited from Franco by appointing Adolfo Suárez, “the great architect of the Transition,” as prime minister. After that he adapted to an institutional role with more clearly defined parameters. I never had any real problems with Juan Carlos. He once asked me why I was anti-monarchical. I replied that it was not a visceral or ideological conviction, but simply the logical consequence of monarchs having a marked tendency to be anti-socialist. González may now wax lyrical about Suárez and his legacy but, in 1979, he was the enemy who needed to be ousted. German Social Democrat Willy Brandt advised the PSOE of the need to destroy the prime minister sooner rather than later if they were ever to become viable electoral prospects. Between 1979 and 1982, González adopted the twin strategies of packaging the PSOE in less threatening fashion to a broad cross-section of the electorate (weeks after being elected into government, he was welcoming reporters from gossip mag ¡Hola! into the presidential palace, who portrayed him as a middle-class family man) as well as courting establishment figures at home and abroad with systematic attempts to undermine Suárez’s increasingly fragile government. At a time when the armed forces repeatedly threatened to veto the consolidation of Spanish democracy, the actions of González and, to an even greater extent, the rabble-rousing political pitbull that was Alfonso Guerra, not infrequently placed the fragile equilibrium of the Transition in jeopardy. Hence, for example, vociferous attacks against the Ministry of Culture for allowing the military to place filmmaker and PSOE image consultant Pilar Miró under house arrest for libel were as much designed to destabilize the UCD as to defend constitutional rights. What surprised me was that nobody — not Alfonso Guerra nor Enrique Tierno Galván — seemed willing to take on the leadership. That was a mistake on their part in my opinion. I remember that Tierno said “at this pace, we’ll never reach the peak of the mountain.” I replied with the logic of shepherds from Nepal: “It’s better to climb with short well-considered steps.” What I saw as unacceptable was to continue leading without having achieved the political victory I sought. I would have quite happily carried on as normal party member. In fact that’s what I did in the aftermath of the conference. I was going to say that I didn’t do any political campaigning, but that’s not entirely true. As a present, I regaled members with Das Kapital alongside copies of the letters in which Marx says that he wants his daughter to marry someone with resources. I knew they wouldn’t digest Das Kapital, but the letters were pleasant reading. First and foremost, however, I used those few months to travel. From the early 1970s onwards, González had carefully nurtured personal and political relations in Latin America. With the support of close personal friend Enrique Sarasola — an impeccably connected and rather shady Basque businessman who first went to Colombia as a Price Waterhouse employee, and later facilitated the entry of Pablo Escobar’s business interests into Spain — the future premier sought to raise his country’s influence in its former colonies. Since the loss of the final vestiges of empire in 1898, Spanish foreign policy had generally been an ad hoc affair, determined by pragmatics and sentimental affinities. Indeed, for all his vitriolic anticommunism, Franco had refused to buckle to US pressure to isolate Allende’s government in Chile, and Fidel Castro was the only head of state to declare a week of mourning following the Spanish dictator’s death. Political instability in the Middle East and the playing out of Cold War conflicts in satellite Latin America states ensured a potentially important intermediary role for Spain in a fast-changing global political landscape. At a time when CIA intelligence on Iran was outdated and incomplete, Suárez’s influence and potential mediating role in the Middle East struck both Jimmy Carter and Margaret Thatcher. Encouraged by both Juan Carlos and the United States, the Spanish premier visited Cuba in 1978. The PSOE’s electoral manifesto had promised the creation of new jobs, but the rationalization of industry and de-regularization of the highly protected Spanish labor market ensured unemployment rose from the time that the PSOE come into power until the country entered the European Economic Community (EEC) in 1986. An improved welfare state did provide a greater safety net for Spaniards than had hitherto been available. Yet the gap between rich and poor increased over the course of the decade. In a rare moment of humility, he nevertheless doubted that New Labour, similarly fixated on the power of urban and popular culture as a means of renewing a non-chauvinistic national pride and exorcising residual fears of radicalism, could potentially have drawn inspiration from the reinvention of the PSOE. González recalled that Professor Lord Anthony Giddens had come to Spain to participate in seminars following the general elections of 1982 and 1986, and would be better qualified to identify any shared genealogies; when I subsequently asked the social democratic theorist — a formative influence on Blair’s thinking — he responded that he had known a range of national and local political leaders in Spain in the 1990s and 2000s but that he did not believe that New Labour was intellectually much influenced by ideas or policies developed in Spain: the US Democrats and the German SPD were the major reference points. In twenty-first-century Spain, González increasingly embodies the establishment left. For Podemos, the “regime of 78” constitutes the original sin of Spain’s failed political reform, a bogus legitimizing force for the establishment and an imperfect form of democracy. The nomenclature bypasses the extent to which the Constitution and the interpretation of democracy it validates only accrued its legitimacy retrospectively. Podemos has strategic reasons to focus its attention on 1978 as opposed to 1982, in its efforts to promote the notion of the elites duping the masses. Indeed, the closed-doors negotiations of the Moncloa Pacts provides a better fit for this narrative than a parliamentary success which, much like Tony Blair’s election win in 1997, received both popular support and uncritical endorsement by many intellectuals and cultural commentators. The Constitution was first drafted on the basis of the major political players (including the Communist Party) enshrining basic individual rights for citizens and workers within a framework that combined market capitalism with amnesty for crimes committed both by and against the Francoist state. This ethos was ratified by the PSOE’s election victory. The incoming government almost immediately ordered that the signing of the Constitution be commemorated annually in schools. December 6 was first declared a national bank holiday in 1983. I don’t regret it in the least. The exact phrase used by the general, a man whose service to his country was exemplary, was the following: “Under the ashes there is fire.” What’s rarely discussed in that, during my presidency, the fiftieth anniversary of the start and finish of the Civil War took place. There were colloquiums, university lectures and all of that was correct. It was something academic. There was not a collective forgetfulness as is sometimes claimed to have been the case but rather a moving on from the past. Anything else would have ended up in a settling of scores. Irrespective of individual opinions on González’s assessment, his thinking was in tune with citizens: there was virtually no pressure from below for an interrogation of the recent past. As a result of the Francoist ideal of the large family, more national citizens celebrated their eighteenth birthdays in 1982 than at any time before or since. On the one hand, early-mid 1980s Spain was a great time to be young: the country caroused hedonistically into one great “coming of age” party, effectively sponsored by the PSOE. Gay Mercader (a relative of both Leon Trotsky’s assassin and the Italian filmmaker Vittorio de Sica) was able to use generous subsidies to entice the world’s leading rock stars to tour the country, the ready availability of relatively cheap pharmaceuticals an added incentive for some touring musicians. Conversely, however, unemployment and the ticking time bomb of a largely undiagnosed drugs problem had a disproportionately negative effect on young people. It was the right thing to do and it wasn’t anything new. Under Francoist legislation, consumption was not penalized according to the judicial ordinances. Nobody mentions that. What we did was a campaign to make this fact public knowledge. And I still maintain this to be the way forward. It is impossible to eradicate the drugs problem by penalizing consumption. What’s needed in the twenty-first century are international regulations to eradicate the trade mafias. The collateral human damage of Spain’s headfirst jump into (post-)modernity has often been sidelined by the triumphalist discourse of democratization. As documented in Netflix series Fariña (or Cocaine Coast) Escobar and his associates were effectively given carte blanche to turn Galicia into the Europe’s principal gateway for cocaine. By 1992, the year Barcelona hosted the Olympic Games, Spain had the highest AIDS rates in Europe: almost two-thirds of sufferers were heroin addicts, and more than 40 percent of heroin users were HIV positive. The wave of democratization across Latin America and the fall of the Berlin Wall nevertheless helped ensure that Spain could for the first time in recent history be held up as a model to emulate. International grandstanding constituted a quick-fire solution for deflecting domestic tensions. In 1988, a successful national strike was called by trade unions in response to further labor reforms. Even the state television channel — now under the control of Pilar Miró, a friend and personal appointment of the premier, who he affectionately recalled as “both radically loyal and independent” — stopped transmitting at a time when private television channels had yet to enter the Spanish media-scape. González admitted that the strike was a significant blow against the PSOE but claims that it subsequently lost momentum because its success was attributable to a fragile coalition between businesses seeking to punish the government for fiscal reforms and trade unions concerned about protecting jobs. In 1991, Alfonso Guerra — to this day the longest-serving MP of Spanish democracy (1977–2015) — was forced to resign as vice-premier as details emerged of the fraudulent activities of his brother, who had exploited his closeness to the Socialist elite for financial gain. It wasn’t as traumatic as people make it out to be. There is no animosity, not on my part at least. What is true is that this kind of rupture is always more painful when the friendship predates the end of the dictatorship. I understood the personal and family situation of Alfonso better than he did. He came from a proletarian family; his father worked on the railways. Alfonso became the head of a family, and he had to look out for the rest of them. It wasn’t, as you have described it, a clan. It was a family that he was protecting. My understanding at the time was that he genuinely wanted to resign. Many of González’s inner circle — including excommunicated Communist and Buchenwald concentration camp survivor Jorge Semprún — expressed their incredulity that the president remained loyal to his right-hand man for so long. For others, however, Guerra’s rigid control of the party apparatus was reassuring, intimating against all available evidence that the PSOE remained rooted in its proletarian history, progressive politics not sacrificed to pragmatism. In opposition, the PSOE had attacked the UCD for fast-tracking Spain’s incorporation into NATO. By 1986, González and the Spanish royal family were proactively campaigning for a “yes” vote in a referendum on continued membership, an act of realpolitik for which the party leadership were never forgiven by many longstanding militants. Javier Solana, Semprún’s predecessor as minister of culture, served as Spanish foreign minister from 1992 to 1995 before being appointed as secretary general of NATO. The definitions of left and right evolved. In the 1980s, the classical distinction was arguably less important than the division between those like me who wanted to construct a European project and those who were not on board. I was great friends with Willy Brandt and then later with Helmut Kohl. Bill Clinton and myself spoke at the latter’s funeral. It was meticulously planned and very well received, an unprecedented act of foreign politicians taking the stage for the funeral of a German premier. What often happens is that an initial conversation leads to an understanding and sometimes, as was the case with Mikhail Gorbachev, a genuine friendship. Surrounded by a doting team who still refer to him as “presidente” twenty-two years after he left office, the overriding impression on speaking to González is that he is struggling to come to terms with a country and continent in which his word is no longer taken as gospel. In the present day, his foremost political and business interests are in Latin America. 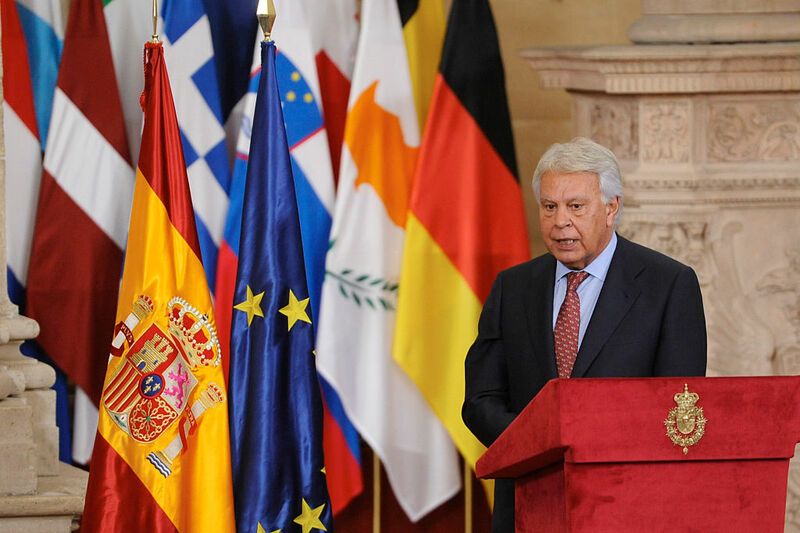 González maintains that relations he begun nurturing prior to Franco’s death are more important than ever: “We have seen the reaction against globalization — the resurfacing of nationalism, Brexit, Trump — and the solutions are to be found through mutual understandings, best forged through cultural and historical links.” The former Spanish president acted as an independent assessor for the opposition coalition in Venezuela and is friends with Leopoldo López, the former mayor of Caracas currently in prison. Maduro has said that he is not going to allow himself to lose elections under his control. Internal revolution and international pressure are the only solutions to make him go. In five years, there is no basic health care in the richest Latin American country. He has become something worse than a dictator: he is an arbitrary tyrant who does not even respect his own rules. My interlocutor gave similarly short shrift to Rebecca Jarman’s suggestion that the declining geopolitical importance of the oil industry as reserves set to run dry has meant that Venezuela is losing strategic interest. He instead attributed any strategic anomalies to the idea that US policy under Trump is prone to change overnight, with little or no apparent logic. Socio-cultural ties aside, Venezuela has become a hotly contested litmus test for democratic values in twenty-first-century Spain especially as a result of Podemos’s sympathies for Hugo Chávez. Political debate has become degraded through the problematic conflation of two distinct sources of criticism: the content and philosophy of the Constitution itself; and its fetishistic veneration as the pre-requisite and guarantor of the nation’s democratic credentials. It is perfectly consistent to accept the former and reject the latter, but this distinction is often lost through reciprocal name-calling and point-scoring. Pablo Iglesias has responded to Guerra’s public condescension by claiming the former vice-premier ought to be given an Academy Award for his performance as a dinosaur in Jurassic Park. In response to me asking about Podemos’s call for the Constitution to be updated, González claimed that. In this regard, I am more in tune with James Maddison than Thomas Jefferson. I favor updating the Constitution by changing the things that need to be changed and leaving the rest alone. As I am one of the, for want of a better expression, architects of the Spanish Constitution, I know that I will be called upon to celebrate the anniversary but I would much rather debate how we can guarantee forty more years of peaceful co-existence rather than always looking back. The Constitution is not untouchable; carrying out the initial amendments would at least force these youngsters who complain about it to read it. They will be surprised by its liberal credentials. It’s much more progressive than the Constitution of most of our neighboring countries. An oedipal battle is being waged between and within Spain’s two purportedly progressive parties. Guerra and González were reunited in their endorsement of the candidacy of Susana Díaz as the PSOE’s new secretary general. She is a former protégé of Guerra and the current president of the regional government in Andalusia, who takes care to speak nostalgically of her coming of age in a golden age of Spanish democracy. Her largely unexpected defeat by the youthful Pedro Sánchez bears testament to a changing of the guard. And González seems unlikely to forgive him for allying the PSOE with Podemos in order to oust the PP from government. When the PSOE and PP agreed with uncharacteristic speed and efficiency to amend Article 135 of the Constitution in 2011, thereby introducing a cap on the state’s structural deficit, the betrayal felt by many was as much psychological as political: successive generations had been raised to believe the text to be sacred and untouchable. In a context where citizens no longer believe themselves to be living in a country in perpetually forward motion, Spanish democracy finds itself at a crossroads, torn between nostalgia for a time when anything and everything seemed possible, and genuine anger against the unrealized potential of a calcified Transition. Like forty years ago, generational differences are proving to be as important as hardwired divides between left and right. Duncan Wheeler holds the chair of Spanish Studies at the University of Leeds.